Don’t ever mention Nandrolone in the presence of Hans Knauss: 1.3 nanograms of this anabolic steroid (which occurs naturally in the human body, in tiny quantities, and is very similar in structure to the male hormone testosterone) were enough to end his career with the Austrian World Cup Ski team. 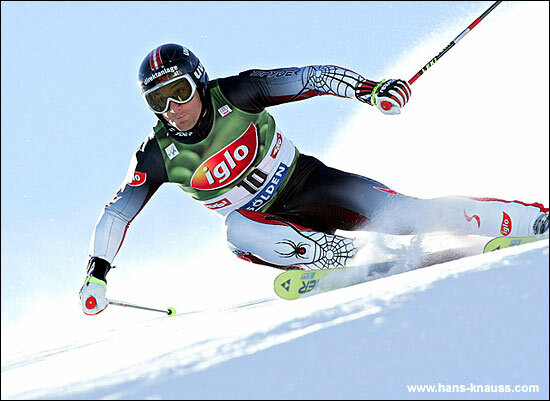 The 2003 runner-up in the Giant Slalom World Cup, and Silver medalist at the Nagano Winter Olympics, found his career in tatters when a routine blood test in December of 2004 showed a Nandrolone count of 4.2 ng, where 2.5 would have been legal. Banned from competition for 18 months by the international skiing federation FIS, Knauss officially called it quits in mid-2005, arguably his only option at age 34. Half a year older but clearly no wiser, and still a competitor at heart, Knauss now announces his return to racing, this time on four wheels. With Renauer Motorsport, he will drive a Porsche 996 GT3-RSR in this year’s FIA-GT Championship. Renauer plans to concentrate on international competition this year, with two cars. The impact of this announcement compares remotely to “Rusty does Rolex!”, if on a somewhat (eight million people in the Alps) smaller scale. With only a select few Porsche Cup races in the VIP car under his belt, Knauss nevertheless convinced team principal Sepp Renauer at a test in late 2005. Knauss will share driving duties with Renauer’s long-time associates Wolfgang Kaufmann, Manfred Jurasz, Claus Schunk and Petr Valek. His goal for the season: podium finishes. The team is certainly up to it: Renauer’s best result in its limited 2005 FIA season was second in class at Brno. Still popular with sports fans, and with a day job as TV commentator to fall back on, hopefully it won’t be “downhill from here” for Hans Knauss.